The features of the design are contained in circular medallions which were used in medieval stained glass windows. Diagonal lines reaching up through the whole window are reminiscent of the shape of the hatchments on the wall on either side. At the bottom there are medallions depicting scenes in Gedling at the end of the Millennium with the Colliery, the Fountain and Gedling House. They are shown with exaggerated vertical perspective to direct the eye upward. A stream of life-giving water flows from the Fountain. A little higher in the centre is an oak tree representing the passage of time with leaves shown in the colours of all the seasons and bare branches for winter. These branches anticipate the cross. Such an oak existed in Gedling in the centre of the old cricket field to the west of the church, this area is now known as the Oake tree drive estate. On either side are the faces of the saints of the church whose work is not yet completed and echo the two medieval stone carved heads higher up either side of the window. 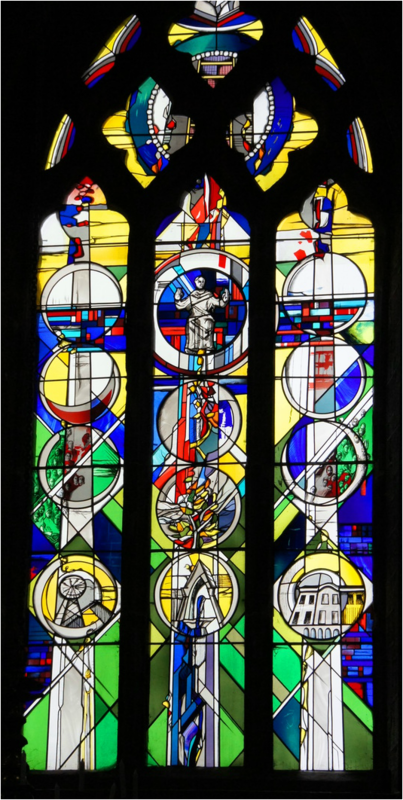 Higher still is depicted the burst of energy at the Resurrection at the centre with the Moon and Sun on either side. The central figure shows Christ in Glory at the intersection of the arms of a cross that forms a background to the whole design. Abstract elements continue the ascending theme into the tracery. The circle in the tracery has glass lenses around it to represent the souls of the saints of the church who have gone before us. In the centre is the Ladder of Perfection, (Jacobs` ladder?) a medieval concept originated by Walter Hilton a monk of Thurgaton Priory in about 1380. Around the top of the window is a rainbow symbolic of God`s covenant with man. At the very top is the symbolic grey and white wing of a dove. 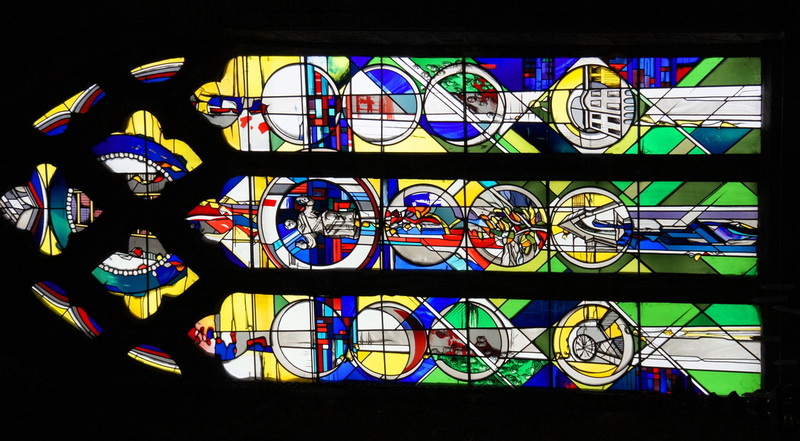 This explanation represents the thoughts of Andrew Johnson who was commissioned by All Hallows to design and build the Millennium West window in 2001. In memory of the men of this parish who died in the Great War 1914-1918 this monument was erected on the north wall of the nave. To read the names please zoom in. 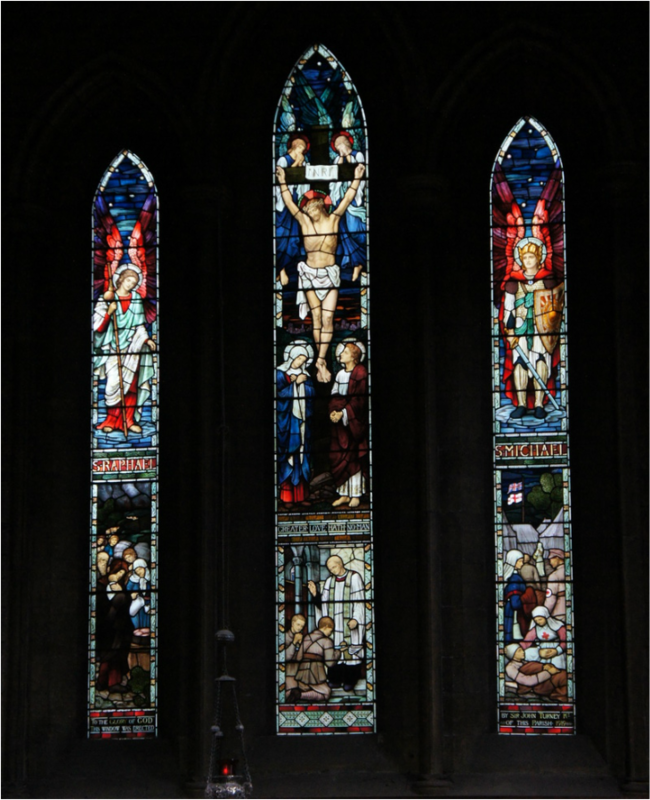 gift to the church installed at a cost of £1000.00 by Sir John Turney in 1919 and is a tribute to those who gave their lives in the Great war. situated on Burton Road next to Carlton le Willows school, there is a matching house in East Bridgford. All Hallows church is a Grade 1 listed building and is unusually large for a rural parish church having five bays in the nave and wide aisles. The tower is 90 feet high and it has a 90 feet tall spire making it the second highest in Nottinghamshire after St Mary Magdalene, Newark. It is located at the west end of the north aisle so we have a west front with a central door. A full description of the church building and its furnishings, stained glass, bells, clock, monuments, war memorial etc. is available on the web-site of the Southwell and Nottingham Church History Project at http://southwellchurches.nottingham.ac.uk/gedling/hintro.php. Here are a few of the more curious features not included there. The south wall of the chancel has a normal priest's door about halfway along but at the west end there is the remains of a blocked door. The string course above it shows that it must have been inserted when the wall was built. There is no obvious purpose for such a door but it was probably used to admit the people at a time in the thirteenth century when the nave was not usable and indicates that the congregation worshipped in the chancel until about 1280 when the door became redundant and was blocked up. The low side window was added later. 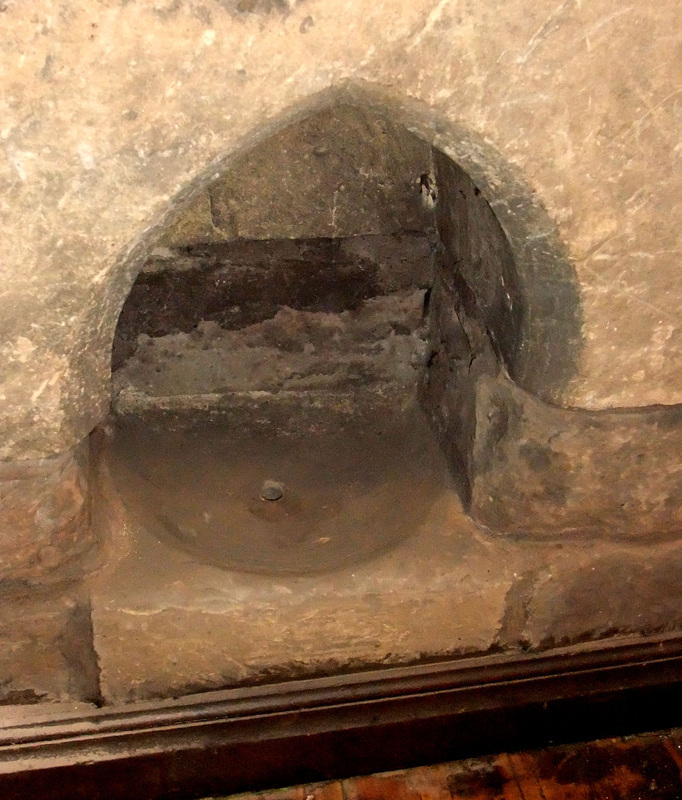 The picture shows a bowl used for washing the chalice after a Mass and called a piscina. This one is built into the outside of the north wall of the chancel and is now enclosed by an extension that was added to the church in 1925. Prior to that it was in the open air. Its presence indicates that there would have been an altar a few feet to the north which must have been in a chapel long since demolished. The two blocked doorways by which it was once entered from the church are still visible. These together with the remains of a wall extending north from the west wall of the chancel show that the chapel was part of a building with several rooms which may have been used by Augustine monks from Shelford Priory which was about five miles away across the river Trent. Our spire has a pronounced 'entasis' meaning that it tapers more higher up than at the bottom. Entasis is a means used by architects to avoid the optical illusion that the surfaces of tall buildings like spires are concave when they really are tapered uniformly from bottom to top. 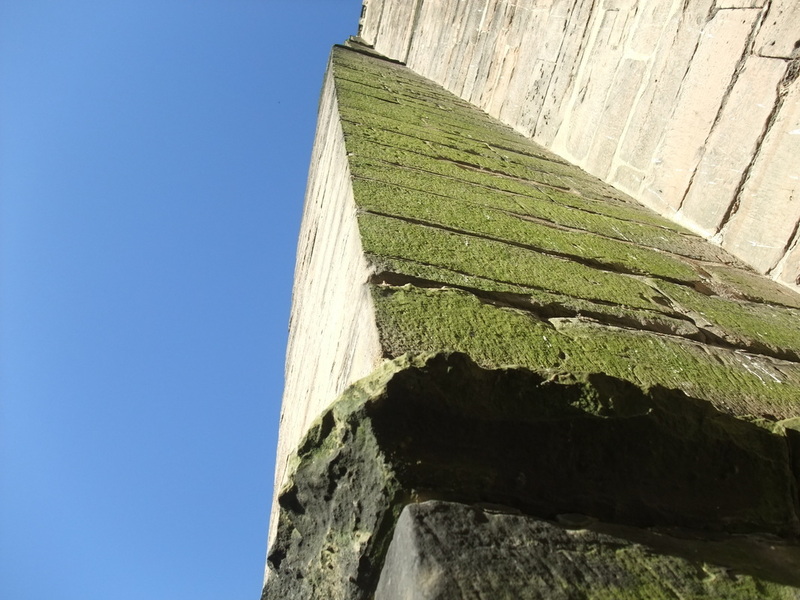 The entasis at Gedling has been attributed to the medieval masons making a mistake and providing too much entasis but if you look up the buttresses which from a distance appear straight you can see that they have sufficient entasis to avoid them appearing concave. The greater entasis on the spire was thus deliberate and gives it a unique profile that Pevsner describes as 'elegant, almost sensuous'.